So, what do you wear when you have to catch the 6:40 a.m. shuttle for a “what the Hell were they thinking when they scheduled it this early” morning meeting? Well, first, you take time the night before to plan out your outfit so you don’t look like a fashion “don’t”. Seriously, I have been lazy and not done this in the past and ended up looking not so good and that’s being too nice. I also learned the hard way to do that all important bathroom mirror check when I get to work to avoid wearing my dress backwards (yes, for an important meeting)and, yes, that really happened. Now I am a little more aware and try to always take a moment to check for major faux pas before facing the boss. I have caught myself sporting only one earring, holes in tights, etc. and managed a quick wardrobe tweak to fix quickly before I embarrass myself AGAIN. Live and learn! But this morning I had prepped the night before and purposely picked my new Banana Republic black sweater (50% off!) that was light but warm with a cutout back detail that was highlighted by the white shirt underneath. Now, this was no ordinary boring white shirt. This was my custom made, fits like a glove, French cuff cotton shirt that I designed in Shanghai, adding print details to the collar and underside of the cuffs. I love it and only wish I had bought a few more while I lived in Shanghai. Add in the dragon cuff links that I bargained hard to get for less than $10 at the South Bund Fabric Mart in Shanghai and the bold turquoise Banana Republic necklace that always garners major compliments (bought last year on sale) and I was feeling good despite the early call. 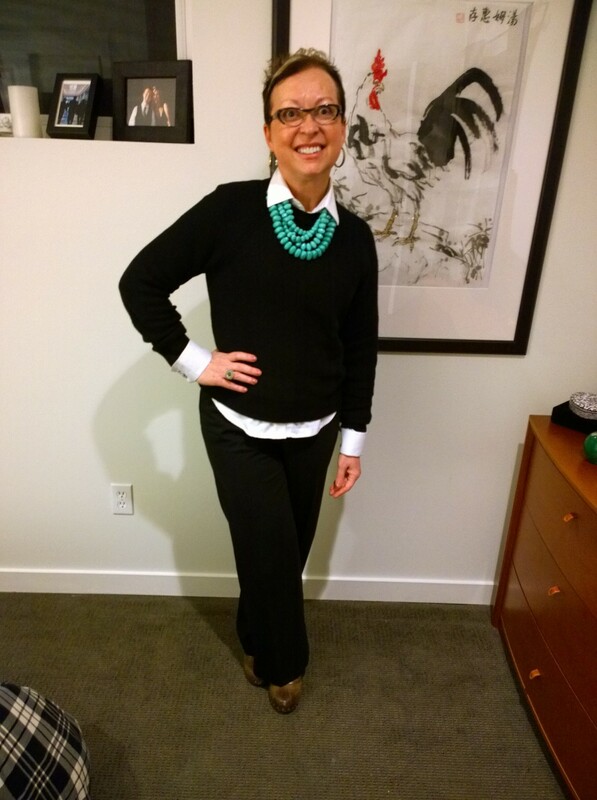 Classy black pants from Nordstrom’s and my comfy Dansko studded heels made this a great outfit for a very long work day. Now, off to plan my outfit for Day 7 so I look decent despite another early call. Good night! p.s.- You owe me that necklace.